Erodium cicutarium, the non-native plant in the experiment. 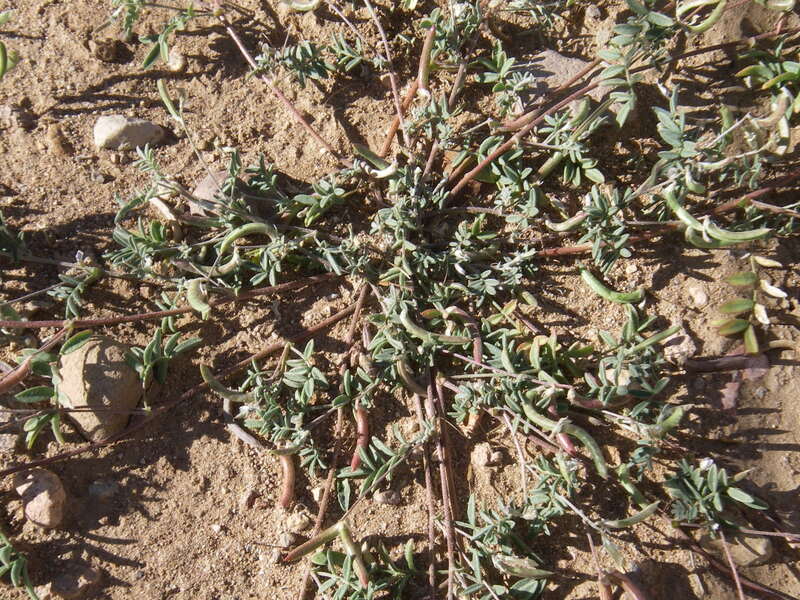 The other was Astragalus nutallanius, a native. Just last week I blogged about the mystery plant in my calla lily’s pot, and how it’s an accidental ecology experiment. Today, Elieza Tang presented her summer research to the lab at our weekly meeting. She was paid by a Research Experience for Undergraduates grant for the summer, a category of money from the National Science Foundation, to do research on the effects of competition on the growth of two desert winter annual plants. She studied these in pots in special growth chambers – kind of like my flower pot in my kitchen! Why was she presenting her summer research in October? Did she not finish this two months ago? Actually, the two month lag time makes sense. This experiment, done in conjunction with the Portal project by Danielle Ignace and Peter Chesson, took some setting up and designing. Growth chambers break, experiments get delayed. Then it took months of watering, watching, and measuring as the seeds in the pots germinated and grew. And finally, once she had the data, she could set out to do one of the most difficult parts of an experiment: remember what the you-know-what her study was about in the first place! In all seriousness, analysis of the results can be one of the toughest part of science, because with a number of results that all vary a little bit, you have to prove there is a signal cutting through the noise that answers your question. The cigarette industry exploited this fact for years, using the noise in studies of cigarettes’ effects on health to argue there was no signal within it. Like I mentioned, Elieza put seeds in pots, placed pots in growth chambers, and faithfully watered and measured them as they grew. Some of the plants had the whole pot to themselves, others shared it with seeds of their own species or the other species, and still others shared a pot with both types of plants. At the end of the experiment, she dug them all up and weighed them to see if plants with many competitors grew less. Many annual plants’ seed production is highly correlated with its size, so this is a good indicator of what the population might do in the future – grow or shrink. And there was one more wrinkle – she grew these plants at three different temperatures. I won’t give away just yet what her results are, nor her conclusions and analysis. But I can tell you it’s exciting because it matches the researchers’ understanding of how these plants interact in nature, and fits nicely into the theoretical framework of the lab. Feel free to leave a comment speculating what happened, or use this to change your bet on whether my calla lily will survive, or the mystery invader will. I’ve begun to see biodiversity and ecology everywhere, even in my kitchen. No, I’m not talking about what ecosystems have sprung up in those month-old house party leftovers…. It’s a slightly more traditionally ecology-y place: in a flower pot. 1) It’s not a lily, though it does look like one. It is actually in a different genus (scientific name: Zantedeschia aethiopica). 3) It can become an invasive weed, although it is unlikely to in arid Arizona. 4) A brief search of Web of Science (a database of scientific peer-reviewed journals that I have access to through the University) reveals that they are studied ecologically as a native part of African wetlands, and that like many ornamental and commercial plants, there is ample research on their genetics and pathogens (diseases) that can affect them. 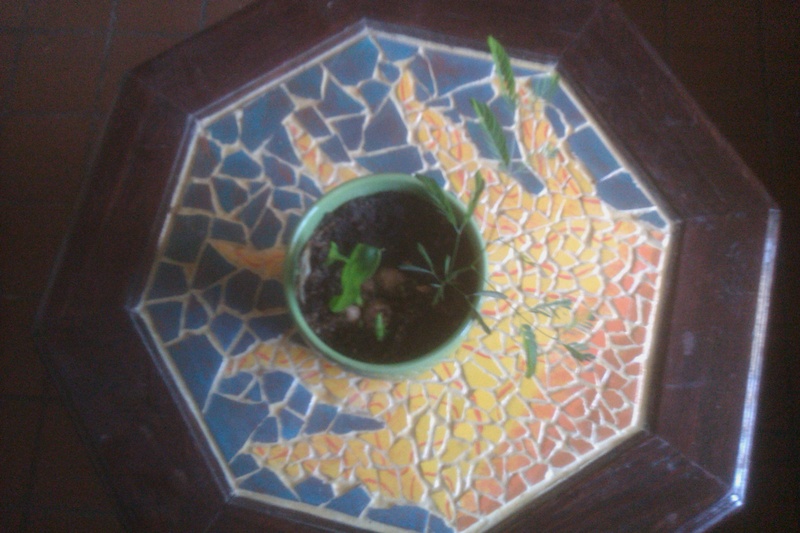 After the original stalk wilted and died back, I continued to water the soil, and place it in sunny spots. (I wonder if the certain gentleman believed I had carelessly let it die?) Eventually, something sprouted and grew. But it wasn’t the calla lily! Now the calla lily is sprouting again, sending up numerous leafy stalks from several rhizomes. 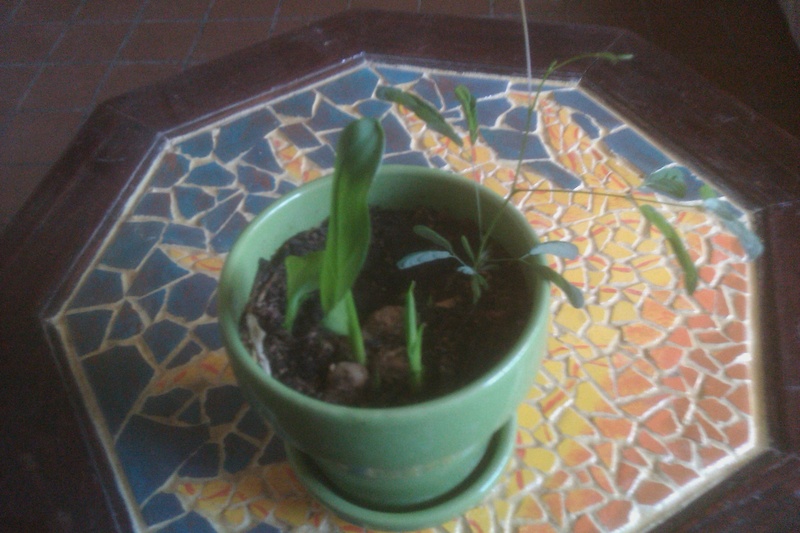 If I want the lily to live, I should remove the extra rhizomes and the other plant. After all, if they get any bigger, they will be in mortal competition. As it is, they are likely to be competing already. And, like any sports fan, I am kind of interested to see how this plays out. So my questions for you are: Who do you think the mystery plant is? (And where did she come from?) Which plant do you think will win? Would you put money on that? It’s about time, you two! My water striders (family Gerridae) have been mating like crazy. Like, for 8 hours one day. I wasn’t there the whole time, but I suppose it’s possible they didn’t even stop. Given our differences in lifespan, that scales (very) roughly to about a solid month for us without getting out of bed (8 hours times 100 strider life spans is 33 days). Only they’re cruising around on top of the water the whole time. It was a tiny little blip and that blip was moving. Moving like it was hopping. In tiny little hops. 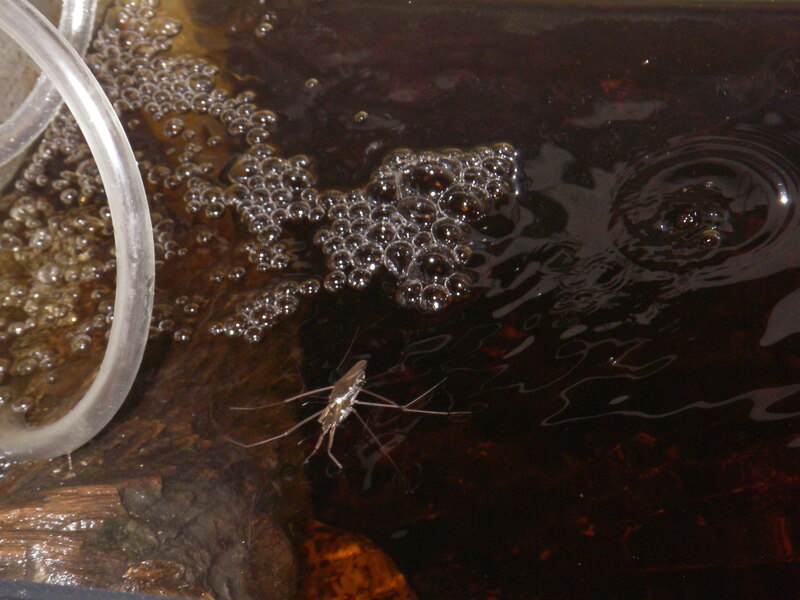 I eventually discovered not one, not two, but four baby water striders in my tank! I imagine they lay more than four eggs at a time (many insects do), so I wonder what happened to the rest of them. Maybe the backswimmers or even their own parents had some easy snacks over the weekend as they hatched. It happens. In the meantime, I have moved the blips over to their very own kiddie pool, given them some rocks and some sticks and leaves to hide in. It looks much lovelier to me without the murky algae, but maybe they find the clear sterility of the water unpleasant. It would be an interesting hypothesis to test, allowing them to chose between habitats. 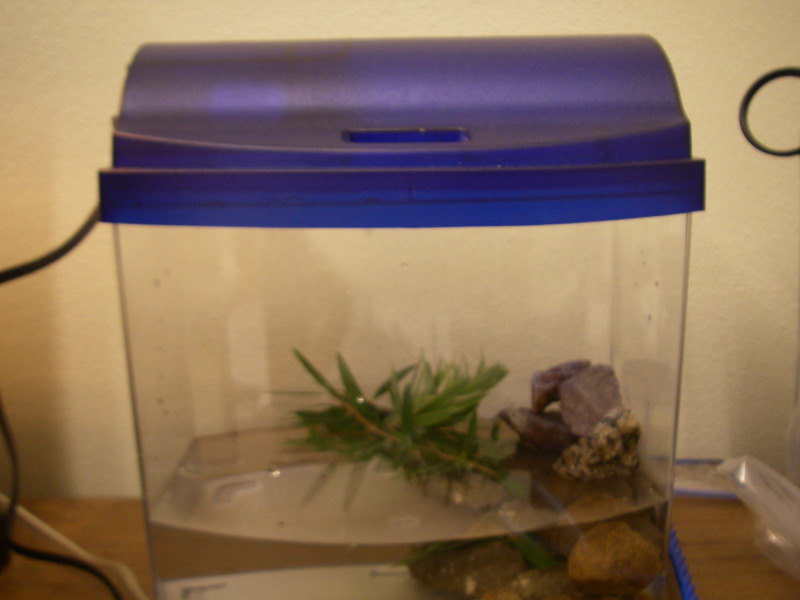 What am I doing raising aquatic insects in my hidden underground laboratory? (Besides being creepier than just having a hidden underground lab?) I may have mentioned my research interest once or twice: biodiversity. Specifically, why we have so much of it to start with. I may also have suggested I am currently working on a theoretical research project which has been a real challenge and taught me a lot. The basic question of it is: does hiding from a predator effect whether two competing species can live together? I’ll explain more about the framework and the techniques later, but I’m thinking about how to test it in real life, and I am thinking about aquatic insects (after all, they are little, with short life spans, relatively simple neural networks, etc.). I posted already about my field trip with another student to count the backswimmers and water striders in pools on Mount Lemmon, and to collect them (yes, we have a Forest Service permit for both). I have kept a few, just to observe their behavior and formulate intelligent (well, I hope) hypotheses. That’s these guys. And now there are more of them. I’m so proud. You’re invited to a mixer! The theme is Southwestern, with some tropical influences. The guest list is rather extensive. This event will draw participants from the Rocky Mountains to the north and the Sierra Madre cordillera to the south. Some Chihuahuans may show up, and certainly plenty of Sonorans, and maybe even some from the California and Nevada Mojave. Oh, and one more thing: for the most part, this is a dry mixer. This mixer is essentially Arizona. For such an arid environment – right in the global belt of deserts at 30 degrees north – it is incredibly diverse biologically. 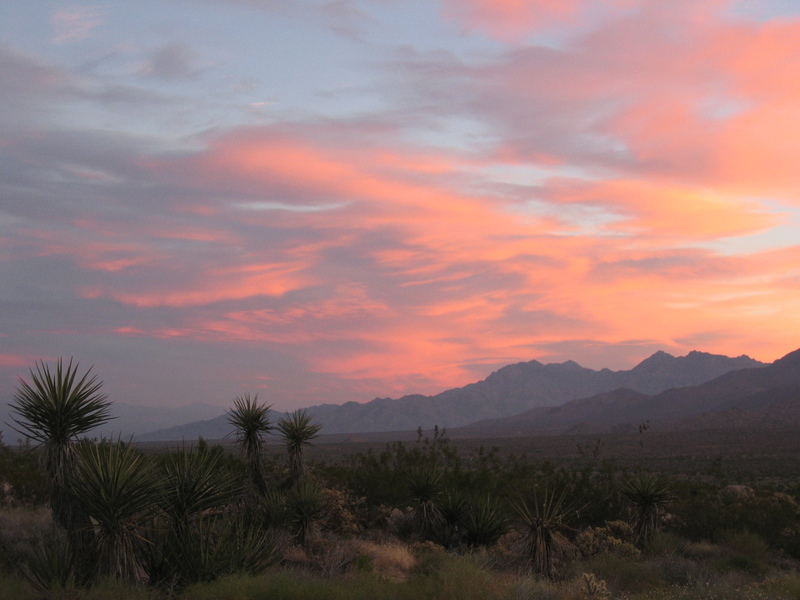 The Sonoran Desert, which is the region encompassing Tucson, is bordered by the Chihuahuan Desert to the east and the Mojave to the north and west. As far as I can tell, in the days of Settling the West these were all lumped in together as the Great American Desert, but now we recognize the differences in the regions. You can see it in the pictures I have taken (below). Then there are the mountains. 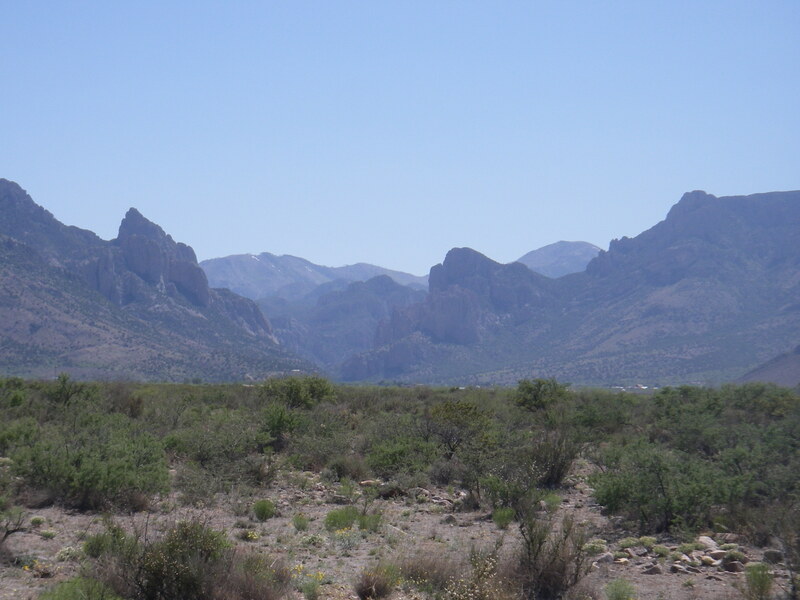 The Sierra Madres to the south, a frightening place full of drug running and violence, have species migrating in from the tropical occidente. The Rocky Mountains to the north, through Utah (my hometown) up to Canada, allow more artic-y species to intrude further south on their ribbon-like finger of alpine climate. 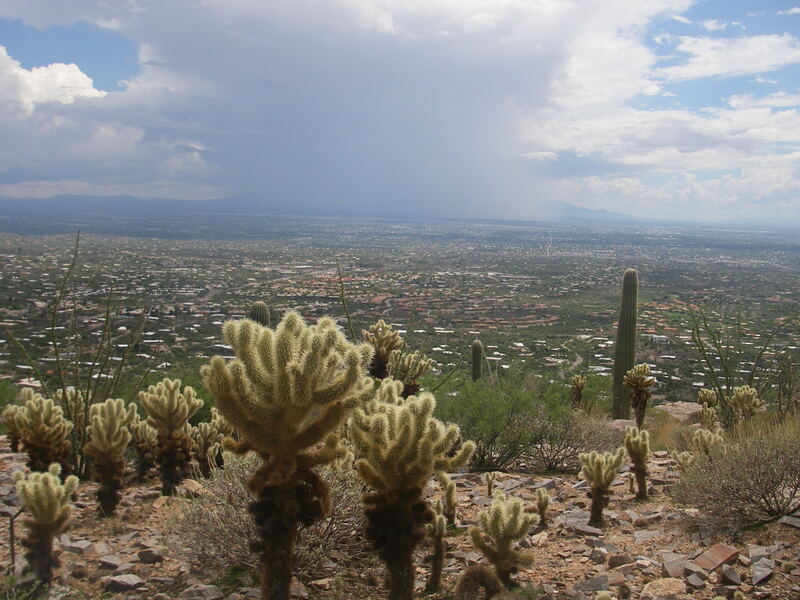 Arizona connects those ranges with a series of “Sky Islands,” small mountain ranges with pine forests clinging to their crowns, bordered by an inhospitable sea of desert. It may be the only place where you can essentially drive from Mexico (complete with parrots but lacking wolves) to Canada (complete with Douglas fir and black bears, but no longer any grizzlies) in an hour or two. Between the relatively low biomass on the desert floor (making math and models tractable), the isolation between the islands in the sky (giving replication), and the gradient of climates and juxtaposition of all these opportunities, this mixer is a great place to study biodiversity. 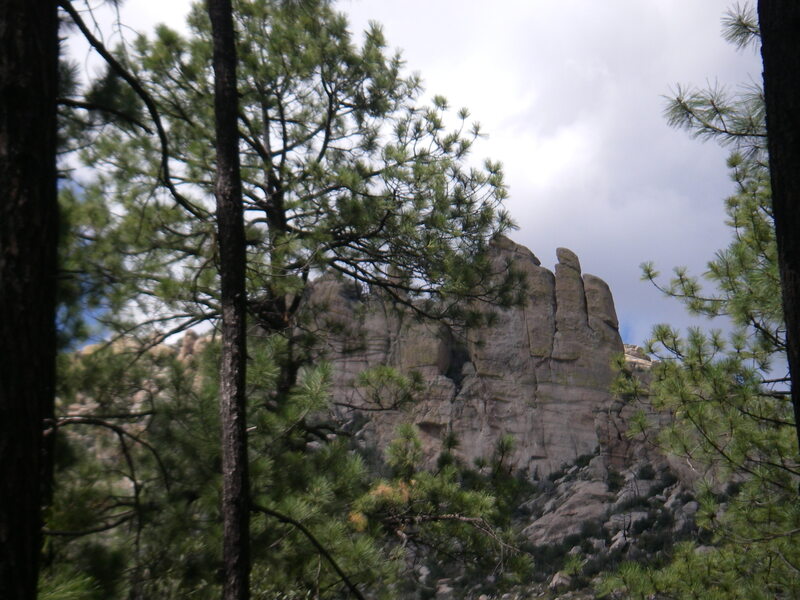 The top of Mount Lemmon is dominated by Douglas fir and quaking aspen. Compare this to the Sonoran Desert shot above. 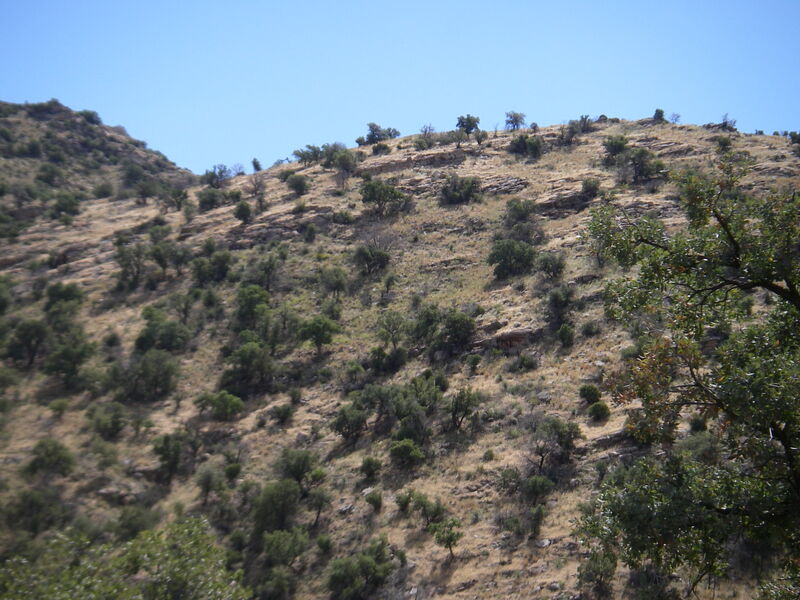 This oak-grassland chaparral is only a couple miles up Mount Lemmon's Sky Highway. A few miles further, you get into oak-pine forest. 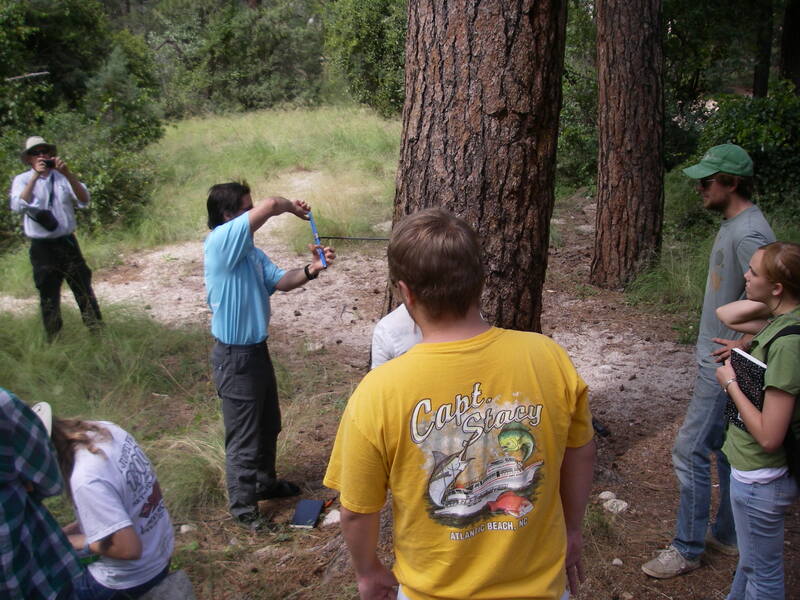 Students are removing a straw-sized core from the tree to count its rings and tell its age. The tree will plug the hole within hours using sap.